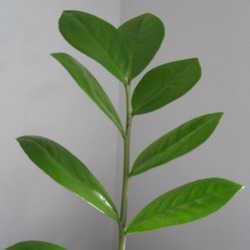 Aglaonemas are durable, versatile plants that are very popular for use indoors and for interiorscape settings. The old standby varieties and newer hybrids come in shades of green with silver or white stripes or splotches. From Green To . . .
One of my first indoor plants was the type shown in the thumbnail picture at right. This plant, Aglaonema commutatum, was amazingly durable and tolerant of almost complete neglect. I still marvel at how that plant not only survived, but grew to a nice size in spite of very low light and only getting water when I remembered. This was when I was in my early teens and had other concerns besides the few plants I had. 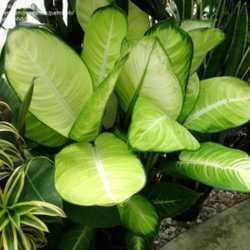 A few years passed before I saw some newer types with large silvery patches or stripes on the significantly larger leaves. I knew something was up in the Aglaonema world when I got my first look at a plant with light pink petioles. One species of Aglaonema from Indonesia even sports a little red coloration in the leaves. 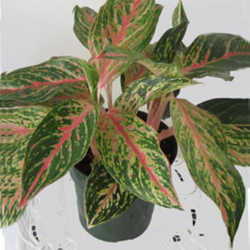 The plant is Aglaonema rotundum, a smaller, slow growing specimen with dark roundish leaves and thin reddish main veins. At that time I dreamed about what kind of hybrids would be possible using that plant and some of the others I had seen. Meanwhile, new varieties of Aglaonema seemed to appear every year or so, but they still showed familiar shades of green and silvery-green patterns on the leaves. Although the horticultural world in the U. S. was largely unaware of it, breeders in southeast Asia were busy producing plants that make some of our favorite Caladiums look dull by comparison. When you see photos of the results of that work, you, too, will find yourself breathless with intense desire! However, as exciting as that prospect is, I must not get ahead of myself. The genus Aglaonema consists of over 60 species that are endemic to tropical swamps and rainforest of southeastern Asia and the Philippines, as well as north to southern China. They prefer high humidity and warm, but not hot, temperatures. They are at their best in lower light situations, and these plants can also help keep your air space healthier in your home or office. Most of the species, varieties and hybrids available until relatively recently have come in various shades of green and silvery variegation as well as having oval to more elongate leaf shapes. Some are larger growers while others are compact, making them more versatile for different indoor situations. Back in the 1960s just a few species and varieties were available, but within the last 10 to 15 years, an array of new hybrids has reached the marketplace. Now, that array is about to explode into a riot of color thanks to those breeders in southeast Asia. In a previous article, I described the Thai Caladiums. The plants that are now being sold are of such brighter colors and new leaf shapes that my feeling was that they would rock the Caladium world. Now the Aglaonema world is about to be jolted in a similar manner because of the new work coming out of Thailand and Indonesia. These Aglaonemas have colors that you have to see to believe. If you are used to the dark green and silvery types of Aglaonemas available in the market, you will be shocked with pleasure to see the fluorescent reds, pinks, oranges and yellows displayed on the leaves of these remarkable hybrids. I have obtained a couple of these plants for myself to test out, and every time I look at them, I am amazed at the colors! Rather than trying to obtain permission to reproduce a few of the photos of these plants here, I urge you to visit a breathtaking collection of these nearly unimaginable new Aglaonema hybrids at the Hybrid Aglaonema Gallery. Some of the new hybrids are available for purchase at Asiatica Nursery, but be forewarned: they are pricey. Hopefully, as they become more widely available, the prices will come down enough for more of us to be able to grow and enjoy them. I've also found for you an excellent handbook about Aglaonemas, and the best news of all is that it is free! Click Success with your Aglaonemas Indoors. The handbook is in PDF format and easy to read right on your computer, or you can print out the 74 pages.